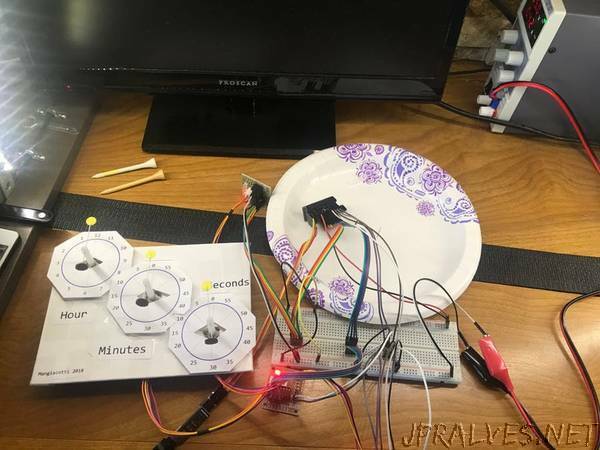 “Use three stepper motors to make the classic analog clock movement in the opposite direction. Since the classic DIY positioning servos I’ve implemented have a 180-degree working range, I decided to use a stepper motor. This code calculates absolute “MoveTo” positions with the information in mind. The second hand makes the correct move of 6 degrees in the counter-clockwise direction from second value 58 to 59. Same for move from 59 to 0. The minute hand makes it’s 6 degree move at the transition of second hand from 59 to 0. However, on the next second hand move (from 0-1), the second hand servo makes the long move in the clockwise direction.